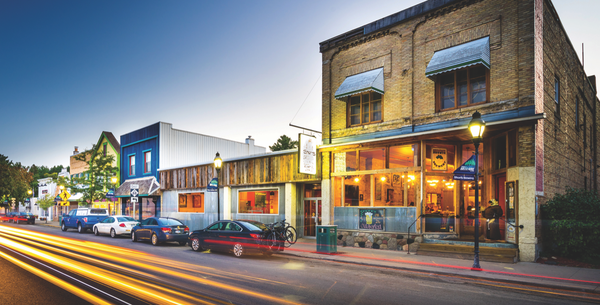 As Traverse City’s restaurant scene continues to grow, two of its newer additions fill a gap — literally and figuratively — that brings both physical change and what its owners deem “market-niche diversity” to downtown’s Front Street. The intriguing twist: They’re both under the same roof. For decades, the open space between Cali’s Cottons and Chase Bank on Front Street in Traverse City provided a shortcut to the alley and parking lot behind, as well as a popular photo op for senior pictures, bridal parties and the like, who posed in front of a large red heart painted on Cali’s ivy-covered exterior brick wall. Word that the property was to be developed to accommodate a four-story office building was received by many locals as unhappy news. For Glenn Harrington and John McGee of the HM Group, however, it was welcome news, since the street-level floor of the building had been designated for a future dining establishment. When Harrington and McGee first opened the Italian-themed Sorellina in 2012, on Park Street, less than a block off Front, they were convinced that it filled an unserved niche downtown. What they didn’t anticipate was that within a few years, it would outgrow customer demand and kitchen capacity. The prospect of having not only a larger venue, but having it on the main street just around the corner, was for them the perfect solution. In the end, the new location also became home to a second business on the premises, Slate. The reason for the double billing? 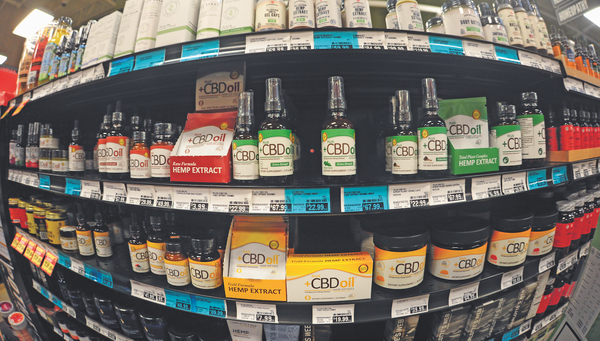 “First of all, because the space inside allowed it, but also because we felt there was yet another niche to be filled in downtown Traverse City. An upscale, prime steakhouse and seafood restaurant in its truest essence didn’t yet exist here,” said Vinocur, who, along with his business partner, Fletcher Gross, is now co-executive chef and part owner of Slate as well as Sorellina. Vinocur emphasized that each establishment is a completely distinct concept with its own menu, décor, and feel. 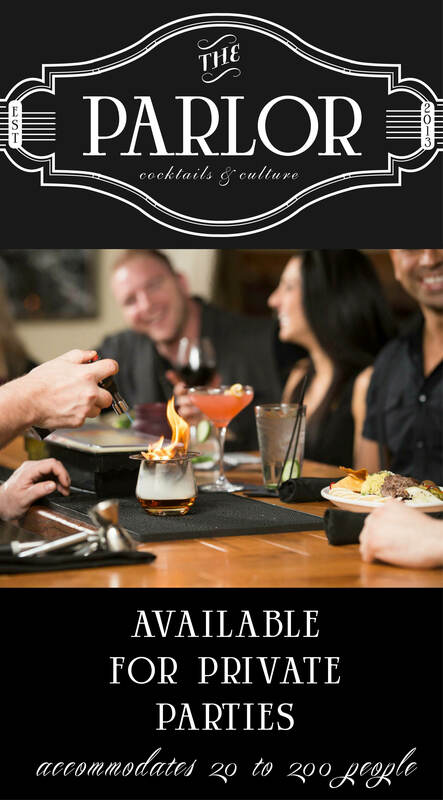 Slate offers an intimately elegant yet unpretentious atmosphere, where customers can indulge in prime beef (from a 7-ounce filet to a 10-ounce bone-in filet, a 14-ounce ribeye, a 16-ounce Kansas City Strip, and a whopping 20-ounce T-bone) as well as other top-of-the-line meats and seafood. “There are other places on town that situationally will serve prime beef, but not to the degree that we do,” said Vinocur. “At Slate, it’s our main focus.” The whole menu is a la carte — a so-called chalkboard menu, to allow for versatility. Diners can order their protein of choice and customize the rest of their plate from an intriguing array of toppings (examples: bourbon-bacon roasted shallot jam; gorgonzola and black pepper crust) and sides (examples: morel mushroom crème brulée; cabernet-braised cremini mushrooms). There is also a composed surf & turf dish on the menu that marries filet mignon and lobster tail. The filet gets an espresso-brown sugar dry rub with just a hint of cayenne before grilling, and the lobster is poached in butter. The finishing sauce is a creative take on traditional hollandaise, incorporating New Zealand Sauvignon Blanc, agave nectar, Key lime juice and Madagascar bourbon vanilla paste. Tired of the same old wedge salad with your steak? Kick it up a notch with Slate’s chop salad (romaine, candied walnuts, tomato “caviar” — a little molecular gastronomy at work there — and gorgonzola-chive vinaigrette), or the roasted tricolor beet salad (grapefruit supremes, fennel, lavender-infused ricotta and pecan vinaigrette). Sorellina’s new space at the Front Street location is spacious and stylish, yet still cozy and casual. Beef carpaccio is one of the newer additions to the antipasti section of its menu. “We take whole prime tenderloins, season them liberally with French grey sea salt, and give the outside a very quick sear, so they’re super rare,” said Vinocur. “Then we put them in the freezer, so they can be shaved properly.” One highlight of the garnishes on the plate is an aioli made with bourbon-smoked peppercorns and white truffle oil, the latter from local oil and vinegar retailer Fustini’s. Vinocur’s own favorite in the antipasti category is the short rib ravioli. “Short ribs are so flavorful. We braise them slowly for a long time, so they’re super tender, and then we make a tasty little sauce for them. We bring that all over to Janene Silverman, the fresh pasta expert at Raduno, and she makes the actual ravioli for us.” Silverman also makes Sorellina’s gnocchi. 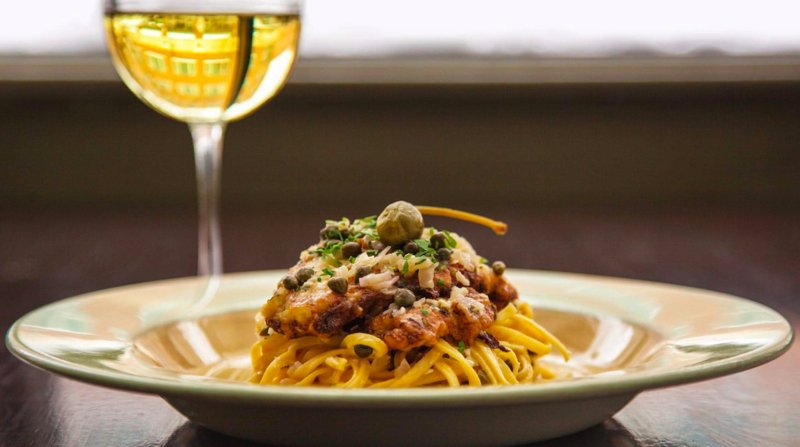 Pasta is, of course, an integral part of Sorellina’s menu, and certain traditional preparations that have been offered since the beginning days at Park Street (like piccata, marsala and alfredo, with your choice of protein) “are not going anywhere,” Vinocur said. “We used to market ourselves as ‘authentic Italian,’ but we have since removed the ‘authentic’ because we wanted to afford ourselves the latitude to do more contemporary things.” Salsiccia Italiana (penne, San Marzano red sauce, house-made Italian sausage with toasted fennel, all baked in a cast-iron pan with cheese and herbs) is a currently a customer favorite — perhaps because of the cooler fall weather. “Italian food is, I guess at its core, comfort food, and that is absolutely a comfort food dish,” said Vinocur. Talk about comfort food, the dessert menu — shared by both Sorellina and Slate — definitely falls under that heading, with homemade Italian specialties that include cannoli and tiramisu and seasonally appropriate rotating selections like flourless chocolate cake, Key lime cheesecake, and white chocolate cherry cheesecake. 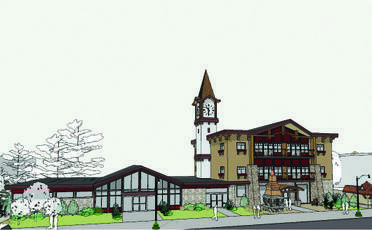 Sorellina and Slate are located at 250 East Front St. in Traverse City. Sorellina is open for lunch and dinner; Slate is open for dinner only. 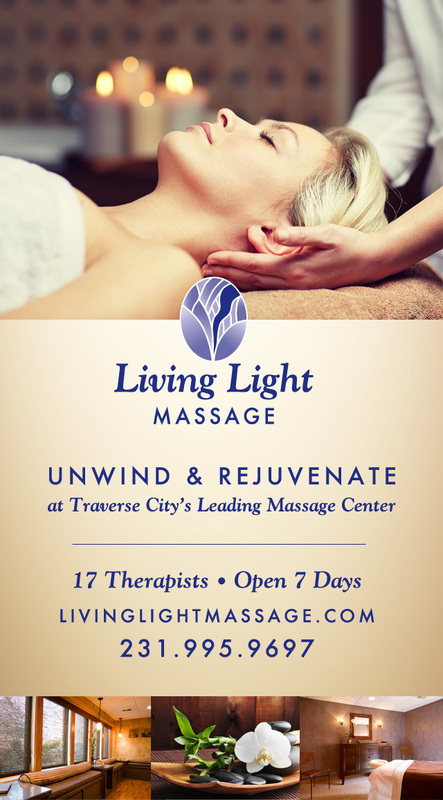 For more information, call (231) 421-5912. The first member of Traverse City’s HM Group family, founded by Glenn Harrington and John McGee, was Harrington’s by the Bay; Sorellina was the second (the name means “little sister” in Italian). 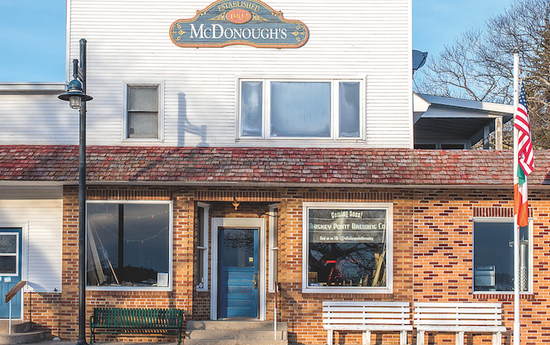 Since then, McGee’s 72 and McGee’s 31 have been added, as well as Grand Traverse Bagel & Bakery, and Events TC Catering. “Catering is a growing segment of our business,” said Vinocur, “and our events coordinator, Kelly Price, directs the catering for the entire group.” Joshua Vinocur and Fletcher Gross became part of the HM Group in 2018.